µMAC-Smart is a portable analyzer fully controlled by an integrated PC with integrated colour Touch Screen, specifically designed for at site monitoring of all water resources. 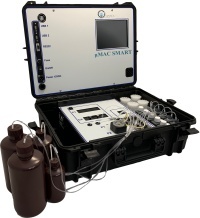 µMAC-Smart is robust and reliable: the analyzer is mounted in a compact and easy-to-transport plastic case including room for reagents and all other accessories. A reagent frame holds all reagent bottles and required solutions. The analyzer is easy to be installed and it is designed for easy operations, the analyzer can be used at site after a quick training. It is delivered from factory fully tested and ready to use reagent kits are available for all standard measurements. Results are stored inside the analyzer memory and can be downloaded through the USB port .Analyzer start up and operations have never been easier! Just turn on and insert the reagents: a simple software will guide the operator through all necessary steps. The analyzer calibration is fully automated; just use the calibration solution as specified in the manual and run. The new calibration factor is checked and accepted if verified to be comprised within acceptance limits. The analyzer can be delivered ready for multiple measurements (MP versions) on the same sample; several multiparametric configurations are available as standard (see here below). The analyzer offers the option for continuous operational mode; the operator can perform sequential measurements several times on the same sample or just leave the analyzer running while the water sample flows. The analyzer identifies off scale samples and reanalyze the water sample after automated dilution. ECO version: COD/TOC (UV254 nm direct reading method), coupled with BOD (fluorimetric method) and TSS (nephelometric method).